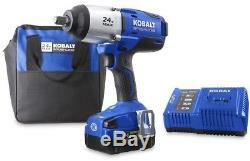 Cordless Impact Wrench Kobalt 24-Volt Max 1/2-in Drive Lithium Ion Battery. 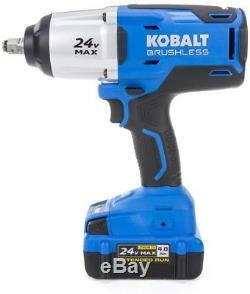 Kobalt 24-volt max 1/2-in cordless impact wrench comes with a 24-volt max high-capacity Li-ion battery, charger and soft bag. Highly-efficient brushless motor provides 650-ft-lbs of breakaway torque. Variable-speed trigger generates 0-1,900-RPM no-load speed and 2,400-IPM for faster application speed. Built-in LED work light illuminates dimly lit work spaces. 24-volt max 4.0-Ah Li-ion battery features a built-in fuel gauge to keep you informed of battery charge. Accessories/Parts Included: Soft carrying bag Charge Time (Hours): 1.1 Color/Finish: Blue Drive Size: 1/2-in Forward/Reverse Rocker Switch: Yes Impact Wrench Size (Inches): 0.5 Impacts Per Minute: 2400 Length (Inches): 9.8 Material: Plastic Maximum Torque Foot/lbs. : 650 No Load Speed: 1900 Number of Batteries Included for Tool: 1 Tool Weight lbs. Our electronic products are manufactured according to the specifications of the US Electrical Standards and Codes. We assume no responsibility if the items malfunction or cause an accident because one tried to use the product with foreign electrical standards. The use of a converter or other voltage transforming device is at your own risk. All merchandise ships from our U. Based warehouses for free within the United States. There they process and forward your item to the address you provided. When returning an item, it must be in all of the original packaging and include all of the original accessories or items that came with it. We do our best to process as quickly as possible. The item "Cordless Impact Wrench Kobalt 24-Volt Max 1/2-in Drive Lithium Ion Battery" is in sale since Friday, September 15, 2017. This item is in the category "Home & Garden\Tools\Power Tools\Impact Wrenches". The seller is "ship-4-free" and is located in Bayport, New York. This item can be shipped to United States, Canada, United Kingdom, Denmark, Romania, Slovakia, Bulgaria, Czech republic, Finland, Hungary, Latvia, Lithuania, Malta, Estonia, Australia, Greece, Portugal, Cyprus, Slovenia, Japan, China, Sweden, South Korea, Indonesia, Taiwan, South africa, Thailand, Belgium, France, Hong Kong, Ireland, Netherlands, Poland, Spain, Italy, Germany, Austria, Israel, Mexico, New Zealand, Philippines, Singapore, Switzerland, Norway, Saudi arabia, Ukraine, United arab emirates, Qatar, Kuwait, Bahrain, Croatia, Malaysia, Brazil, Chile, Colombia, Costa rica, Panama, Trinidad and tobago, Guatemala, Honduras, Jamaica.